Disney and Marvel’s Black Panther became the first film since James Cameron’s Avatar to hold the #1 position on the box office top 10 chart for five consecutive weeks. According to Box Office Mojo, Black Panther has become the 14th biggest grossing film worldwide and it’s still going strong. Black Panther‘s main competition over the March 16-18, 2018 weekend came from Warner Bros Pictures’ Tomb Raider. The 2018 revival of the video game-inspired film franchise stars Alicia Vikander (Ex Machina) as Lara Croft. The new Tomb Raider didn’t come close to matching the opening weekend numbers of 2001’s Tomb Raider with Angelina Jolie. That film rang up $47 million over its first domestic weekend and went on to gross $274 million over its worldwide theatrical run. The sequel, Lara Croft Tomb Raider: The Cradle of Life, saw its opening weekend numbers fall dramatically from its predecessor’s. The 2003 action film only brought in $21 million domestically over its first weekend and $156 million total during its theatrical run. Next weekend will find Black Panther facing off against the romantic drama Midnight Sun starring Bella Thorne and Patrick Schwarzenegger; the animated sequel, Sherlock Gnomes; and the thriller, Unsane, with Claire Foy. However, its main competition will come from the sci-fi sequel, Pacific Rim Uprising, with John Boyega and Charlie Day. The Black Panther Plot: Black Panther follows T’Challa (Chadwick Boseman) who, after the events of Captain America: Civil War, returns home to the isolated, technologically advanced African nation of Wakanda to take his place as King. 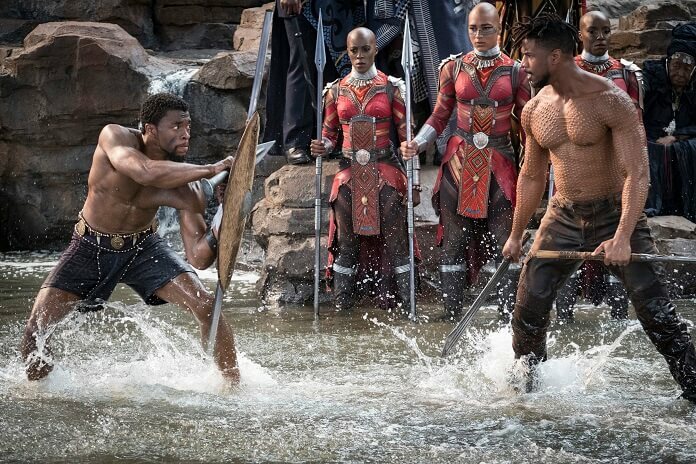 However, when an old enemy reappears on the radar, T’Challa’s mettle as King and Black Panther is tested when he is drawn into a conflict that puts the entire fate of Wakanda and the world at risk.